Size: 1.5" x 2.8" x 0.55"
The Datamath Calculator Museum received this PLT USB1 Universal Serial Bus Module together with some unique graphing calculators as a loan from Texas Instruments in February 2008 to photograph and document it. 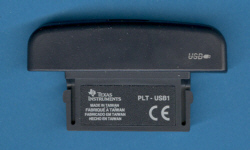 This PLT USB1 Universal Serial Bus Module was developed for the PLT FHH1 and PLT SHH1 to connect with external devices using the USB 1.1 standard. The related PLT SHH1 offeres with the PLT DS1 Data Sled a second option to supports USB 1.1 connectivity. Disassembling the PLT USB1 reveals a rather complex circuitry with a serial EEPROM with 4k Byte capacity and a power supply.